MERMAID SPA: Newly-renovated Mermaid Spa is the perfect mash-up of Old World/New World Russian banya, or bathhouse, scene. Men and women, both the elderly and the impeccably young and fit, lounge around in tiny bathing suits, sweating out toxins in steaming hot saunas or cooling off in icy pools. And if you have no qualms about forms of interrogation torture, spring for a $50 platza treatment, in which you are lightly beaten with an olive branch in a piping hot steam room (but seriously, it’s really fun). A day pass runs $40 (only $30 through September 15th! ); massages and specialty treatments are priced a la carte. SHIBUI SPA: The Greenwich Hotel’s guest spa opened to the one percent a few years ago, and since then it’s been offering up high-end massages, body scrubs and facials in its Japanese-themed space. Specialties include the Oxygen Awakening facial ($225/hour, $300/90 minutes), which features a glycolic peel and facial and finishing masks; the Bamboo Glow body treatment ($400/120 minutes) includes a mint mineral bath and a sea algae wash; and the Elemental Well-Being massage ($235 hour/$315 90 minutes, or $280/ $360 with an added bath soak) involves a dry body brushing, massage with your choice of oils and an optional bath add-on. You can also opt for a $95 sake soak, which, according to Japanese lore, will clear evil spirits and give way to new beginnings. Do note that while you no longer have to be a guest to use Shibui’s spa services, you should call well in advance to book your spot, and they do not allow non-guest groups. THE SPA AT MANDARIN ORIENTAL: This Upper West Side hotel spa is considered one of the premiere day spas in the city, and with treatments starting at around $300, the price tag lives up to its reputation. But if your Great Aunt Birgit magically leaves you a few thousand bucks, spend them here: elegant facilities, above-and-beyond service and top-of-the-line treatments make this the most luxurious relaxation space in town. You can book specific services like body treatments (Personalized Ocean and Earth Body wraps, ginger, mandarin and frankincense scrubs), facials (Vitamin Infusion, organic sunless tan) and massages (shiatsu, aromatherapy, Thai yoga massages); if you’ve got time and cash to burn, they suggest you book one of their “journey” or “suite experience” packages, three hours plus of themed (Thai, Ayurveda, Oriental Harmony, etc.) treatments that include scrubs, massages and tub soaks. The spa boasts fancy private suites, a JEWELED SAUNA, a vitality pool and tasty snacks post-treatment; plus, it’s on the 35th floor of the Time Warner Center, with stellar views of Central Park. ASIA TUI-NA WHOLENESS: Aesthetically, this Flatiron joint has more in common with a medical facility than a luxury spa. And the deep-tissue massages here are not for bodies that bruise easily; the technicians here will beat the crap out of you, crawling on top of you and digging their knees into your spine as they claw out those muscle knots you’ve earned through hours spent bent in front of a computer. You will grip the table as spikes shaped like human hands tear into your shoulders, back and legs, and you will cry out for more, more, MORE when your $60 hour is up ($90 for 90 minutes). If the glorious pain doesn’t do the trick, they also offer cupping therapy—an acupuncture-type situation in which hot round cups are suctioned onto your back—for an extra $10. Spa Castle has two locations in NYC: 131-10 11th Ave in College Point, Queens (718-939-6300,spacastleusa.com) and at 115 East 57th Street between Park and Lexington Avenues in Midtown East (212-750-8800, scpremier57.com). RUSSIAN AND TURKISH BATHS: This East Village institution isn’t exactly luxurious, but if you’re looking for a schvitz and a dip in a cold pool, this is the place to do it. Pop into a piping hot sauna (the Russian room is particularly intense) and sweat out all the beer you drank last night, then jump into the ice pool to cool off at the end. You can also score an invigorating (if slightly terrifying) platza treatment, or opt for a salt scrub or other massage if you find the idea of getting beating by an oak branch terrifying. A day pass runs $35—treatments are extra. GREAT JONES SPA: Great Jones Spa is one of the loveliest spots in the city, offering luxurious massages, manicures and facials complete with the added bonus of access to their famed water lounge. The treatments themselves are standout, if pricy. A rock river facial ($150 for 60 minutes) comes complete with a cold and heated stone wash followed by a repairing mask; the aromatherapy massage ($140 for 60 minutes) uses hot scented oils to promote relaxation and the Rosemary Citron Sea Salt Scrub ($150) involves a vigorous all-over scrub using Rosemary, Lemon Peel and Safflower Seed oil. 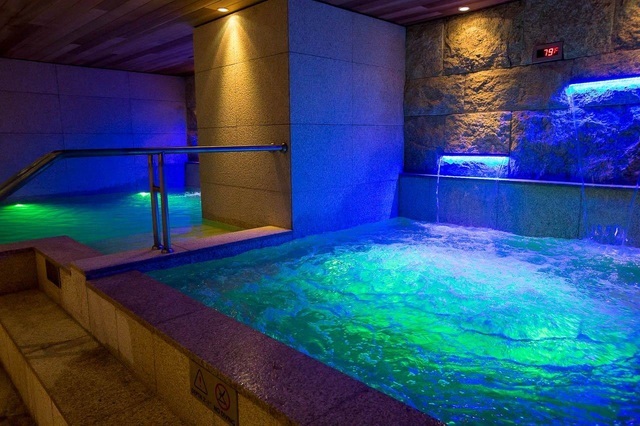 Post-treatment, hang out in the spa’s wet lounge, complete with a massive indoor waterfall, hot tub, plunge pool and neighboring saunas to let out a little extra steam. AIRE ANCIENT BATHS: While the average New Yorker is grateful just to have hot water, Aire Ancient Baths offers an immersive thermal bathing experience for those who find their hygiene to be lacking in intrigue. Conceived in Seville, the AIRE company’s spas are of the ancient Roman variety specializing in “thermally variant bathing,” a process of dunking oneself into water of various temperatures that is definitely not as unpleasant as it sounds. METAMORPHOSIS DAY SPA: Metamorphosis Spa is located right in the heart of Midtown, providing a quiet oasis within the nexus of noise and crowding. The spa is known for its attentive and unpretentious service, according to its website, because no one wants to be judged for cramped shoulder muscles. Metamorphosis also provides an extensive breadth of spa options, so no matter what pain you’ve been sitting with, technicians will be able to knead it out of you. While the hour long massages reach above $100, they offer 25 minute options for much less: $70 for deep tissue, $60 for Swedish, $75 for aroma therapy, and $50 for a mini-facial.